"NYSQ are the New York Standards Quartet - a group of American virtuosi who can stick pretty close to a classic-jazz approach while sounding as if they're discovering the fun of those straight-ahead methods rather than simply polishing them up. This time, the New York lineup - early Coltranesque saxophonist Tim Armacost, pianist David Berkman and sometime Herbie Hancock drummer Gene Jackson - are joined by a Big Apple expat: double bassist Michael Janisch." FOR IMMEDIATE RELEASE - On March 18, 2016, Whirlwind Recordings proudly releases The New York Standards Quartet - Power of 10, celebrating ten years of touring/recording together. 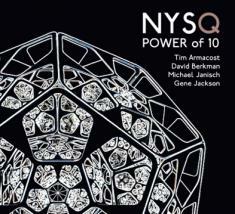 Power of 10 is the NYSQ's second recording for the label and the much-anticipated follow up to The New Straight Ahead. The New York Standards Quartet is: Tim Armacost (saxophones), David Berkman (piano), Gene Jackson (drums), and Michael Janisch (double bass, and also the owner of Whirlwind Recordings). "We were thrilled to team up with the great Michael Janisch for this project. He was a perfect fit with the group and he brings his unique voice to the music," said the NYSQ. "Bands are like weeds," New York Standards Quartet pianist David Berkman says, "a lot of the time they come about accidentally, because of luck and circumstances, without much pre-planning." In the case of this band that circumstance was a shared love of, not only jazz, but also Japanese culture. Tim Armacost is a Grammy nominated saxophonist who has performed with Kenny Barron, Bob Hurst and Ray Drummond among many others, and is the NYSQ's founder. 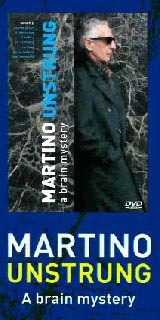 He has lived in Tokyo several times and has performed there for years. Gene Jackson, a drumming powerhouse well known from his nine years with the Herbie Hancock trio, as well as his performances/recordings with Dave Holland, the Mingus Band and Wayne Shorter, is married to a Japanese woman and splits his time between New York and Tokyo. David Berkman, a fiery pianist who is both rooted in the jazz tradition and a harmonically adventurous improviser and composer, is a thirty-plus year NYC veteran of many bands including Tom Harrell, The Vanguard Orchestra and countless others. Berkman, also married to a Japanese woman, frequently travels to, and performs in, Japan. Of course, coming together is one thing, staying together, is another. What began as a happy coincidence of three friends, three master musicians, playing together in a foreign land (documented on Live In Tokyo), has grown into a mature, imposing collective that has become far more than the sum of its impressive parts. Arguably, the most cherished moments in the history of recorded jazz have come from bands, due to the time these groups have had to reach a level of mutual understanding, respect and affection. It is this way with the New York Standards Quartet, as evidenced in their four previous acclaimed recordings, and the impassioned responses from audience across the U.S., U.K., Europe and Japan. "This band was a weed that hung in there through difficult conditions with a lot of perseverance in order to flower into the band it is today. It is a source of great pleasure and pride for all of us that we are still together and going strong, learning and developing and making music," said Berkman. Gene Jackson added that, "one day I was driving my car listening to a special radio show about the Modern Jazz Quartet. It became clear to me that reaching the type of interplay and communication the MJQ had can only be accomplished by developing together as a band for many years. I realized that if we committed to keeping the NYSQ together there could be many benefits, musically and otherwise. Often when things got difficult, when we had reached points where the thought of disbanding seemed plausible or even reasonable, I'd repeat my views to Tim and Dave on staying together, no matter what. I am grateful the NYSQ has chosen the road less travelled. Every time we hit the bandstand together it is obvious we made the right choice. I look forward to the days when, through our commitment to this band, we inspire other bands to stay musically connected, just as the example of the MJQ inspired me." The mission of the New York Standards Quartet has always been to interpret standards and traditional jazz tunes in a way that would allow audiences to connect and be engaged, while at the same time, playing in the contemporary jazz style the members have developed through their many decades on the New York jazz scene. While Power of 10 celebrates the 10th anniversary of this band, it also shines a spotlight on the group's incredible ability to explore music, together. Tim Armacost explains further, "David was explaining what being a band for 10 years means: that the result of staying together is that we've become totally familiar with each other's playing. When one of us is going for something new, reaching for a different take on a tune, or just pushing the moment forward, everyone hears it immediately. You can feel what the other players are thinking. So when one of us gets inspired and starts a search, or finds a new angle on a tune, everyone jumps in to see where the music will go, or moves over and makes a space for something different to happen. Participating in those moments of discovery is intensely exciting, and that spark is what gives the music its life." Berkman, who writes much of the band's original repertoire, has a distinctive flair for re-casting well-known jazz standards in new and unexpected settings. On Power of 10, songs like "Deep High Wide Sky" and "Hidden Fondness" are melodies based on the chord progressions of "How Deep is the Ocean" and a reharmonized, "Secret Love". In the hands of the NYSQ, his arrangement of the well worn standard "All of Me" becomes a daring, harmonically tense vehicle for Armacost's mighty soprano playing and Jackson's powerful drumming. Armacost's arrangement of "Lush Life" brings a new perspective to this classic Strayhorn ballad, and his "Green Doll's Phone" is a playful treatment of "On Green Dolphin Street," written to showcase the brilliant technical prowess of bassist Michael Janisch. Gene Jackson, the band's rhythmic center who drives the music forward with fire and infectious good spirits, is in fine form (as always) throughout the session and contributes his brilliant arrangement of Elvin Jones' "Three Card Molly."